Honorary Chair Chris Rodgers, Douglas County Commissioner Mistress of Ceremony Kandiss Crone, KMTV Action 3 News Join us as we honor companies and community organizations who have demonstrated a commitment to advancing the principles of equal opportunity. This year’s EOD Honorees include the Omaha and Economic Development Corporation– Community Organization Award, Wells Fargo Bank–Corporate Community Outreach Award and the Corporate Award winner will be divulged the day of the event. Gary Gates is the President/CEO, of OPPD. Mr. Gates began his career at OPPD in September 1972 and in May 1989, Mr. Gates was named executive assistant to the president, and he was appointed division manager— Nuclear Operations in February 1990. He was promoted to Vice President with responsibility for OPPD’s nuclear organization in November 1992 and became President and CEO in January 2004. Tickets are $75 per person, Tickets for a table of 10 are also available. For more information or to purchase tickets, please call 402-453-9730. Registration and ticket purchases can be done via our website at www.urbanleagueneb.org. Billing Manager Anita Johnson Contributing Writers: Eri Albert Femi Awodele Rev. Selwyn Q. Bachus James Barnes Paul Bryant Dr. Michelle Chang Yvette Coppage John Ewing, Jr. Dr. Viv Ewing Rev. Dwight Ford Sheva D. Ford Janice Gilmore Greg A. Johnson Lesley Leach Rev. Bruce Norris Velma J. Sanders Patricia Tinder Amanda Paris Kellie Paris Asaska Pastor Darryl Brown Angel Martin Deborah Neary Deborah Powell Contributing Photographers: Donnie Branson Herb Thompson James Barnes Revive! Omaha Magazine is a publication of SMBEnterprises, LLC and is distributed via mail and selected locations throughout the Greater Omaha area and beyond. ©2010 SMB Enterprises, LLC. All rights reserved. Reproduction in any form, in whole or in part, without express written permission from the Publisher, is prohibited, excepting individually copyrighted articles or photographs. The views expressed herein, whether expressed as fact, fiction, opinion, advice or otherwise, are those of the authors and do not necessarily reflect those of the ownership or management of SMB Enterprises or Revive! Omaha Magazine. Manuscripts and photographs submitted for publication are welcome and should be accompanied by a stamped, self-addressed envelope if their return is desired. We reserve the right to edit, use, or not use materials submitted. The publisher assumes no responsibility for return of unsolicited materials. The publication of any advertisement in this issue does not constitute an endorsement of the advertiser’s products or services. The Empowerment Network presents… The 5th Annual State of African-Americans and North Omaha 2012 Preview of Goals and Community Initiatives Harper Center on the Campus of Creighton University Open to the Community 602 N. 20th Street 8:30 am - Breakfast and Networking 9:00 am - State of African-Americans and North Omaha Report 10:00 am - 2012 Preview and Goals See the ad inside and go to www.empoweromaha.com for more info. The Empowerment Network and Community Partners present... Christmas in the Village at 24th and Lake Noon to 8 pm Open to the Community Come join us for a new holiday tradition and celebration! Indoor and Outdoor Activities for Children, Adults, and Families Visit Santa, Holiday Jazz, Carriage Rides, Music, Food, Shopping, Children’s activities, and much more... See the ad inside and visit www.empoweromaha.com for more info. Merry Christmas from Revive! Omaha Magazine Please celebrate “the reason for the season” at a local house of worship. Kwanzaa Events Please check the www.reviveomaha.com calendar or www.empoweromaha.com for events hosted by Charles B. Washington Branch Library and others. 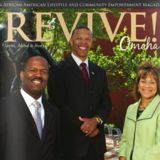 Please check www.reviveomaha.com, www.empoweromaha.com, or www.cityofomaha.org/MLKcelebration/ for Martin Luther King, Jr. Celebrations, including; the Interdenominational Ministerial Alliance’s MLK, Jr. Unity Service, MLK, Jr. Unity Luncheon and events hosted by Creighton University, the City of Omaha, and others. Girls, Inc. Mutual of Omaha Dome • 33rd & Dodge Street 5:30 pm - 9:00 Doors open, Vendors available for shopping Dinner buffet in Mutual of Omaha’s Food Court with interactive chef sampling station! Raffle drawing Maryellen Hooper, Comedienne Ticket Prices: $75 per person and $50 per person for those under 30. Casual attire. For more information, contact Jane at Girls, Inc. at 402-457-4676 Make a reservation at www.girlsincomaha.org This event is recommended for those ages 18 and older. programs that create jobs, training, and business ownership opportunities to improve the quality of life of Established in 1977, Omaha Economic Development Corporation (OEDC) works to identify and implement economic development projects and community reviall area residents. talization programs that create affordable housing, jobs, training, and business ownership opportunities for residents in north Omaha. OEDC seeks to remove those barriers low-income individuals and families experience in realizing their inherent worth and in strengthening their communities. Throughout its history, OEDC has arranged for nearly $50 million in investments and equity contributions to sponsor revitalization initiatives. by Pastor Darryl Brown Jr.
and you should end up retrieving what was lost. God calls us to go back! We get ahead of ourselves, move too quickly, etc. ; and God simply wants us to get back to point A, rethink where we went wrong, and allow His directing voice to be reiterated in our spirits. “Reminders can come the easy way or the hard way. The easy way is no different than when you lose something valuable.” The hard way is once we have gotten deep into hardships due to our disobedience and we feel that we are at our weakest moment, back against the wall, that our ears and hearts become tender to the Word of the Lord. We then have the “He told me so” moment. It is where we realize that we wouldn’t be in the mess we are in had we listened to the Lord in the first place. Experience is a good teacher, but not every lesson has to be learned in the classroom of experience. they that wait upon the Lord shall renew their strength. Do not forget that by His stripes we are healed. Do not forget that He is a way maker, a provider, a protector, a deliverer, a strong tower, a healer, a keeper, bridge over troubled waters, peace in the time of storm, joy in sorrow, and more. Deuteronomy 11:18 - “Therefore you shall lay up these words of mine in your heart and in your soul, and bind them as a sign on your hand, and they shall be as frontlets between your eyes.” This text admonishes Israel in their quest for the Promised Land, to be certain not to forget the Word of the Lord. He commands different ways for them to remember. He tells them to put it (the Word) in their hearts. He then tells them to bind it to their hands. Hands represent doing. He is saying in all of their doing, they are to do based on the Word. Then He commands them to wear the Word as a frontlet between their eyes. He wasn’t literally telling them to wear a written copy of the Word on their head. But rather to have the Word present between the eyes, meaning the Word would affect their sight and their thinking. In summation, don’t forget! Be reminded regularly of God’s Word over and for your life! NOTE: As always consult with your physician before starting any exercise program. When we think of working our core we usually only think of working our midsection to get a great set of abs. But, we don’t realize that having a strong core means more than a washboard stomach. Activities of daily living like walking, picking up kids, lifting boxes, and exercises like playing tennis or jogging require a strong core. The core consists of the gluteus, back, rectus abdominals, internal and external obliques, shoulders, and chest. The ability to transfer power from your legs to your upper body depends on the strength of the midsection. This is what functional training is all about. These are some of my favorite exercises that will not only trim your waistline, but also give you more power to throw a ball, swing a golf club, and walk faster. The exercises I’ve put together not only work your upper and lower abs, but your obliques (the muscles on your sides we call the “love handles”), your buttocks, shoulders, and lower back. Start out with the lower options until you can safely advance to the higher options. Tubing is also used in order to have resistance while standing. (This is an inexpensive equipment and you can find at any store). Start on your back with your legs bent, knees are directly above your hips and arms out to the side. While keeping your abs tight and shoulders on the floor, slowly lower both legs to left, then extend one leg at a time. Hold for about 2 seconds. Bend both knees and return to starting position, then slowly lower to the other side. Repeat the sequence. Start on your right side with your right elbow under your shoulder, bottom leg bent and top leg extended touching the floor (as shown). Extend and reach your left arm overhead and lift your left leg (as shown). Then take your left elbow toward your left knee. SIDE HOVER WITH CRUNCH Start on your right side with your elbow under your shoulder, both legs extended and hips lifted. Extend and reach your left arm overhead and lift your leg as shown. Hold the position for 30 to 45 seconds. For more of a challenge, take your left elbow toward your left knee (not shown). This is a more difficult exercise as you try to keep your hips lifted while bringing your knee to your elbow. Start by lying face down with your chest on the ground (not shown). Extend arms out front as your lift your chest off the floor, while squeezing your glutes and lower back. Hold this as you open your arms out the side. Hold for two seconds. Return to starting position. This is great for lower back strength. Start by lying face down on the ground with your toes touching the floor (not shown). Arms are folded with hands overlapping and head on hands. Lift both legs while squeezing your buttocks, keeping your head resting on your hands. Hold for five seconds. Return to starting position. This is great for glute strength. Lesley Leach is the spokeperson and Program Facilitator for Live Well Omaha Kids 54321 Go! She is an Ace-Certified Personal Trainer, National LesMills Body Pump trainer and Registered Nurse. Lesley is also the author of the book, Just Move. Start by standing with right foot placed through handle of tubing and left foot on halfway point of tubing(as shown). Keeping your abs tight and chest lifted, lift your right leg toward the back while keeping your foot flexed. Do 8 repetitions. Then switch legs taking the left leg to the back for 8 repetitions. Next, take the left leg out to the side (as shown) to really work the hip muscles. Do 8 repetitions, then switch to the other side. You may feel the burn in glutes and hips. Option: Donâ&#x20AC;&#x2122;t use tubing and simply use your body weight. Make sure your standing leg is soft at the knee and do not lean to the side as you lift. Article first appeared in 2008. Baking gingerbread cookies. Making snowmen from the fresh fallen snow. Drinking hot cocoa in front of the fireplace. snowflakes made from recycled or scrap paper. They can be hung by the windows, doors or on the Christmas tree. Many of the holiday traditions and warm memories we grew up with can be shared with our own children. It is also a wonderful opportunity to create new memories and traditions for our families that can be passed on to the next generation to come. Outdoor play: There are many activities children can play outside. These include making snowmen, having snowball fights or sledding. Make sure the children are dressed for the weather. Always check the weather (from the TV, radio, internet, etc.) to make sure it is appropriate for children to be outside. Games: Although there are many board games that children enjoy, there are also some inexpensive games that children can play. For example, use the holiday story books and ask questions pertaining to the story. What are the names of Santa’s reindeer? What made Frosty come to life? What was the gift that the hero boy (main character) received from Santa in The Polar Express? The person or team that gets the correct answer gets a point. The team with the most points wins. Cooking: What would the holidays be without food? Cooking can be a family event. There are many cookbooks that can be found in your local library. Recipes can also be found on cooking programs on television, as well as the internet. The art of cooking doesn’t have to be elaborate. It may be as simple as making cookies and decorating them. Remember to take precaution when cooking with children. Celebrate this holiday season by making memories with your children that will last a lifetime. Dreamland Park, OSBN Parking Lot, and 24th St.
Christmas Trees and Light Displays Free Carriage Rides (12 to 6 pm only) Choirs, Gospel Artists, and Carolers Free Hot Chocolate and Cookies at various locations. Toy Shop with Santa’s Elves, Crafts, Christmas Displays throughout the Building, Refreshments (Hot chocolate, apple cider, and Christmas cookies), Treat bag for the kids, Holiday Music, Nativity Scene and Canned Food Drive (bring an item and receive a raffle ticket). Support North Omaha Businesses! PARTNERS: Empowerment Network, Mayor Jim Suttle’s Office, North Omaha Collaborative Elected Officials, City of Omaha, North Omaha Neighborhood Alliance, Love’s Jazz and Art Center, Impact One Community Connection, Revive! Omaha Magazine, ConAgra Foods, Nebraska Arts Council, North Omaha Arts Alliance, Pastors, Ministers, and Faith Leaders Covenant, Family Housing Advisory Services, Omaha Star, Styles of Evolution, Omaha Economic Development Corporation, Nebraska Investment Finance Authority, Omaha Small Business Network, NAACP, 100 Black Men of Omaha, Mt. Moriah Baptist Church, Zion Baptist Church, the Last Few, and others are joining daily! Go to www.empoweromaha.com or call (402) 502-5153 for more information. I call the Dissatisfaction Principle. The Dissatisfaction Principle says that I will not change until the dissatisfaction of where I am outweighs my reasons for staying in my situation. Like many of you, I would start being faithful for a few weeks, and then life would happen and I would stop. I had a membership to the local gym but never used it. I had an exercise bike in my bedroom that I used as a clothes rack. Some of you probably have done the same thing. Here’s my advice. Take the clothes off of the exercise bike and start riding it for 10 minutes each day. Do it today, tomorrow, and the next day so that it becomes a habit. Increase your time as you get into a regular routine. To get off the starting block, I faced the reality of what happens when you ignore a healthy lifestyle and made up my mind to change. I told myself that I wanted to have a healthy life. thighs, and look great in a swim suit! Third, make a list of all the things that you want to change regarding your health, life, a situation you are facing, your career, family, or finances. Chances are that you have already been thinking about it. In less than 10 minutes you can probably write down several things that need to be changed. Take a few minutes to jot it down. Fourth, create opportunities for yourself to be successful. I made a list of the actions that I needed to take to have a healthy lifestyle and carried out the actions consistently. The actions included buying more fish and chicken, buying low fat foods or no fat foods and wheat bread, making sure that there were fresh vegetables in the refrigerator. I also put all of my workout clothes in one place in the closet so that I could easily find them. I set a time that I would begin and end my exercises for each day. A specific goal helps you to stay on track. Also, I gave myself permission to mess up occasionally and forgave myself if I did, and then continued on the healthy lifestyle path. Fifth, work your plan. I wanted to exercise every day. So that is exactly what I did. I started with exercising in the evenings after dinner by myself or with my daughters. I worked my way up to two workouts a day-one in the morning and one later in the day when I had extra time. I made time in the morning to do stretches, 100 crunches, and ride the exercise bike for 30 minutes. I also carved out time over lunch or immediately after work. Yes, it is a time sacrifice but I tell myself that I am worth it. Start today. Don’t wait any longer because tomorrow is not promised to you. Another way to look at it is to stop thinking and start doing. That is what I did. You will have long-lasting health results, feel better, look great, and have more energy. Pick your own exercise routine or life improvements that you want to have and stick with it. Sometimes the hardest part is just getting off the starting block. So get off of the starting block today. You’re worth it. Get any insurance quote today and Allstate will give $10 to the Tom Joyner Foundation to support students at HBCUs. To learn more, contact James Stinson, Jr. (402) 498-2718 No purchase necessary. For each quote received, $10 will benefit the Tom Joyner Foundation. Maximum Allstate donation is $200,000. Program begins July 11, 2011 and ends December 31, 2011. Tom Joyner Foundation name is used with its permission, which in no way constitutes an endorsement, express or implied, of any product, service, company or individual. Like most people, I assumed that in order for me to get my grocery budget down any lower, I would be forced to spend hours clipping coupons and end up eating brands I didn’t like. I soon found out I was wrong. After applying a few new methods to my weekly grocery shopping and meal planning for the month, I have cut my grocery budget in half! You don’t have to follow all the tips listed, however I have found that applying all these principles have made a huge difference in my budget. I believe that anyone can do this and still eat the brands you and your family love. In today’s market, we are all looking for ways to save money. Many times one of the most overlooked categories is our grocery budget. When I was looking for ways to cut my household budget, I never paid much attention to my grocery category. It wasn’t until I was challenged to add up my receipts for one month that I realized I had to make a change, and fast. Create a grocery budget. One of the first tips to cutting your grocery bill is to make sure you have a budget set in place. Once you have determined how much you spend in groceries per month, challenge yourself to gradually cut back on the amount. I started reducing my budget by $20 per week. Once you start applying some of the tactics listed in this article, you will be amazed at how quickly you can reduce the amount you spend each week. Use cash only. No credit or debit cards. Every month, I withdraw cash for my allotted monthly grocery budget. Some people may prefer to take out a weekly amount. Cash allows you to see how much money you are actually spending. By using cash, you can physically see how much money you have left for the month. It keeps us accountable to our budget. benefits to cutting your grocery budget. Having a list ensures you purchase all the necessary items you need for that trip. This prevents extra shopping trips, which saves you time, money and gas. Second, the list will allow you to stick with your budget. Don’t stray from the list. Plan your meals. This principle has proven to be very valuable for my budget, time and peace of mind. Before the end of every month, I sit down and plan out the meals for the next month. Once I have listed my meals for the month, I write out my grocery list based on the meals. This ensures me that I will not over buy items or leave the store without an item. For many of us, this means fewer trips to the grocery store. is a favorite product your family loves, email or call the company. Many have coupons online or you can register with them to receive coupons or specials. Many stores now stack coupons. This means you can use a store coupon specified for that particular store with a manufacturer’s coupon for that product. A store coupon will always specify the store on the coupon. Store coupon policies can change, so always check with your store to ensure their policy allows stacking. Compare prices. Many stores will match their competitors’ prices. Bring in the ad and they will give you the price of the item listed, even if their price is higher. This can save you time and money. Not all stores price match, make sure to check with the store on their policy. Cutting your budget takes time and discipline, but is well worth the effort. Remember to take small baby steps and you will see a difference in your budget. Share your comments and tips on how you make the most of your grocery budget at www.ReviveOmaha.com or Facebook.com/ReviveOmahaMagazine. RentSmokeFree.org This project is supported in part by Region 6 Behavioral Healthcare through funding provided by the Nebraska Department of Health and Human Services/Tobacco Free Nebraska Program as a result of the Tobacco Master Settlement Agreement. we have occasional spikes in gun violence, overall trends show a measurable decrease, comparable to other cities that have received national recognition for reducing street violence. Other trends have continued to go in the wrong direction and we must address them with a sense of urgency. We have a long way to go on all of these fronts, but it should be made abundantly clear that many in the community have been hard at work to address issues related to poverty and unemployment. I’m thankful that so many have rolled up their sleeves and put in effort to make positive changes in our city. Imagine what will happen when even more join in and do their part! Omaha, because of its strengths, has the unique opportunity to be the first city in the country to close longstanding gaps related to education, economics, housing, and quality of life. God has provided everything that we need to make it happen. We need more in the community to step up and do their part! One of the most pressing needs is support from the business community to help address unemployment and underemployment. Here’s just a sample of the collaborative initiatives and projects that have been launched shortly before and since the World-Herald story in 2007 (this is not a complete list): Major Collaborations: North Omaha Collaborative Elected Officials, The Empowerment Network, Building Bright Futures, Omaha Serves, LiveWell Omaha, and others. Education and Youth Development: Midlands Mentoring Partnership, Learning Community of Douglas and Sarpy Counties, Black Male Summit, Omaha Education Association’s Collaboration and Effective Teacher’s Initiative, North Omaha Cradle to Career Initiative, Mayor’s After School Initiative, Mayor’s Truancy Prevention Program, Communities In Schools, Nebraska School Attendance Initiatives, Middle School Learning Initiative, Collective for Kids, OPS Careers for Kids Initiative, OPS Wilson Focus School, Avenue Scholars, University of Nebraska Academy, Amachi Mentoring, 100 Black Men’s Young Men’s Mentoring Initiative, 100 Black Men’s Saturday Academy, Urban League’s Youth Empowerment and Urban League University, NorthStar Foundation and Outward Bound, Omaha Cares, and others. X Foundation International Center, Adams Park Revitalization Plan, Metropolitan Community College Master Plan Expansion, Ames Street Financial Corridor Expansion, St. Richards Development, and others. Health and Healthy Families: BBF School-based Health Centers, Marriage is Cool, North Omaha Health and Healthy Family Initiative, No More Empty Pots, Charles Drew Farmer’s Market, Metropolitan College Sustainability Initiatives, Hunger Free Heartland, and the Douglas County Healthy Corner Store and Communities Putting Prevention to Work Collaborative. And, this is just the short list. In addition to these new initiatives and projects, hundreds of organizations and thousands of residents have actively engaged in developing and implementing solutions to address long standing gaps in education, employment, housing, and poverty. There’s much more to share. Stay tuned and until then, if you’re not involved, now is the time. There is a role for everyone to play. DO YOUR PART! Rise Up. Unite. Rebuild the Village. For more information, please go to www.empoweromaha.com. It’s Time Omaha! After getting bit by the social justice, civic engagement and community rebuilding bug in his high school years, Maroney’s career has led him to work for and launch organizations focused on youth development, financial literacy, housing, microenterprise lending, entrepreneurship, and economic development. He has personally led the development of over 400 housing units in North Omaha and attracted over $50 million dollars in financial investments from a variety of funding partners. Over the years, he has worked along side some of North Omaha’s most notable community leaders and elected officials, past and present. Now, as President and CEO of Omaha Economic Development Corporation, he and strategic partners are embarking on the historic rebuilding of North Omaha through the Village Zone Revitalization Plan. The comprehensive vision unanimously approved by the Planning Board and City Council, seeks to connect the rich history of North Omaha with a thriving, sustainable future and is now part of the City Master Plan. Behind the scenes, Maroney has continuously and consistently made significant contributions and investments, personally and professionally, to help individuals and organizations pursue their missions. Everywhere you look, even though you may not realize it, you can see the hand of Michael Maroney at work. Revive! 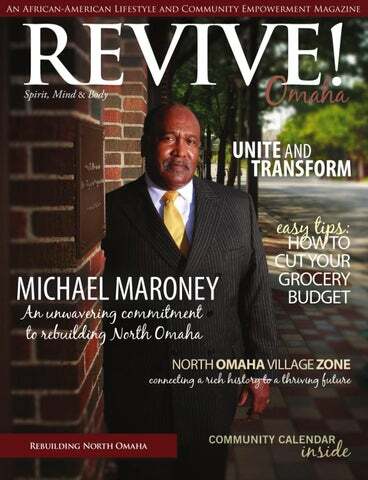 Omaha Magazine was truly blessed to have the opportunity to sit down with Mr. Maroney in November 2011. His love and passion for North Omaha is unquestionable. He holds the history of North Omaha as sacred, but sees even greater days ahead. He believes the greatest adventure is just around the corner. of a 14 year old girl, a controversial appearance of George Wallace at the Civic Center, and the assassination of Martin Luther King, Jr. served as the final straws to the discontent which had been fueling for years. The overt racism and discrimination produced a level of hopelessness that could no longer be contained. Maroney reflected, “the people took out their frustration on their own community.” Realizing there was no way to impact other parts of the city because of the heavy police presence placed on the borders of North Omaha, residents rebelled and burned businesses and establishments along 24th Street. “I refer to them as rebellions because they were the result of racist policies, in your face discrimination, and the unwillingness of the larger community to respond to even the smallest demands. Riots are what happen after a team wins a world championship and people take to the streets to celebrate, but end up burning cars and buildings. There’s a difference. Rebellions occur when people are tired of the way they have been treated and after repeated attempts to be heard are met with resistance and even more poor treatment.” The events accelerated white flight. “a corrugated container mogul” referring jokingly to his brief coownership of a box company. Then, in 1987, he returned to the Wesley House as the Associate Director of Programs. He was asked to lead a housing effort and facilitated the development of a 10 unit housing project at 19th and Grace. He simultaneously was selected to serve as chair person of an organizing committee to establish a credit union in North Omaha. The Citizens Community Development Corporation Federal Credit Union received its charter, opened for business in January 1993, and Maroney served as president until the credit union merged with a larger credit union in 1996.
however, that OEDC provided the opportunity to have an even greater impact in North Omaha, with a shorter timetable because of its resources and 15 years of history. He applied for the position and was offered the opportunity to join OEDC as President. joined facilitator and founder Willie Barney, Teresa Hunter, and Greg Johnson for some early conversations. It was the beginning of a yet to be name approach of working together in a more collaborative way. Maroney had this to say about the transition in thinking and working: “We had been operating in silos and vacuums, and based on the research we were not making the difference that we all wanted. We were working, but not seeing the impact or affect that we wanted. The Network focused on connecting the dots. It made us ask, why couldn’t we work in a more cohesive and collaborative way? The larger community, corporate, business and political leadership were always expressing concern about the fractured black community. They were always asking why we couldn’t work together.” “Now, with the evolution of the Network, we have created, as close to we’ve ever had, a single voice. For the most part, we are speaking together with a united front. In a sense, I think we’ve surprised people with our willingness to collaborate. With the Village Zone plan we now have many opportunities for everyone to participate. It has the potential for anybody who wants to be a part of the change in North Omaha. We have a way for all of the pieces to work together.” This is the “something different” that Maroney and others were looking for. memberships are numerous as he has served in many capacities. Though his sacrifices and commitment can never be fully compensated, he has been recognized with the many awards including, Metropolitan Community Development Award, Omaha Fair Housing Award, the Durham Western Heritage AfricanAmerican Civic and Community Leader Award; and, Urban League of Nebraska’s Community Service Award. Even with these awards and recognition, Maroney remains a humble presence and is most proud of his family and their accomplishments. His wife, Dr. Barbara Hewins-Maroney, works at the University of Nebraska at Omaha, in the College of Public Affairs. He has two daughters who also were born and raised here in Omaha. Kendra, graduate of Spelman College in Atlanta, GA, works for United Air in San Franscisco, California. His daughter, Morgen, graduated from Wellesley College in Wellesley, MA, and recently relocated to Seattle, WA, just this year. His entire family is committed to education and Michael himself holds a Bachelor of Arts degree in Urban Studies from the University of Nebraska at Omaha and an MBA from the Executive MBA Program at the UNO College of Business. While North Omaha and the City of Omaha will never fully appreciate the breadth and depth of Michael Maroney’s impact on his beloved community and city, there is no question he has already made a measurable difference in the lives of thousands of residents, and future generations will be even greater beneficiaries of his legacy of commitment. Revive! Omaha Magazine salutes Michael Maroney. We look forward to chronicling the next chapter of his work and the exciting, continued revitalization of North Omaha. Why did you decide to run for U.S. Congress? reach their goals. I love meeting and encouraging people. I get to share the vision, listen, and sharpen my focus. I believe that we need real leadership, leadership that can bring people together to focus on common sense solutions. First, I believe that government should work for the people. Government is not the full solution, but it shouldn’t be a hindrance. Congress is not listening. Some in Congress want to privatize Social Security and Medicare. We need to listen to the people on this issue. They don’t want it privatized. Secondly, we have far too many people without jobs. On a national level, there are 14 million people without jobs, with an unemployment rate of 9%. Locally, the African-American unemployment rate is 18%, and in parts of North Omaha it’s as high as 30%. Other areas in the community are also dealing with high unemployment and poverty. Finally, we need to focus on providing our youth with the best education possible. We need to focus on workforce development, training on jobs available now and in the future. We are competing with others on a global scale. Locally and nationally, the response has been very positive. In Douglas County, people recognize the work that I’ve done in the Treasurer’s office. We’ve built a great team. We provide service efficiently and effectively. We’ve implemented ideas to make it easier for the public to interact with the office. On a national level, we’ve received national endorsements, including some that will be announced after this article is printed. What are your top 3 priorities? 1. J obs, jobs, jobs. The number one priority has to be putting people to work. We need to rebuild our infrastructure. We must strategically rebuild our economy. 2. We need to prepare our youth and young adults for the jobs of the future. People in their 30’s, 40’s, and 50’s need help getting retrained. Our citizens need new skills and training. We must include our trade unions and community colleges to help retrain our workforce. 3. We should not privatize Social Security and Medicare. Why should people support your campaign? I am responsive to the people. I’ve proven that I’m not afraid of anyone. Working at the Police Department, I had to face people with knives and guns. I tell people if they fight for me to get to D.C., I’ll fight for them. Yet, I don’t think we can have polarization. We must get things done for our district and our country. On a national level, we need people who are willing to work across party lines. We can’t have people saying no to everything. We have to ask ourselves what works best for the whole district and the whole country. We need a congress that is working for the people. We need to change the people in D.C. to get a different result. We need to get things done. Our district must have an impact nationally and we must be a part of the national dialogue. are possible and if they get behind me, I will work to help them reach their goals.” What impact would this have on African-Americans? No More Empty Pots is a grassroots non-profit 501c3 organization. It began for the purpose of connecting individuals and groups to promote local, sustainable, businesses that improve self-sufficiency and food security through advocacy and action. For more information, please visit: www.nomoreemptypots.org. Fall vegetablesâ&#x20AC;&#x201C;really? Are there foods that grow in the fall in Nebraska that I can eat? You bet. And guess what? They can be good for you and taste great! When you make a discovery like that, why keep it to yourself? Share these tips and recipes. And if you follow one of the hotter trends, make it a handmade holiday gift. Make it greener by using local seasonal products as the main ingredients. The following are a few tips highlighting fall produce: 1. Grow fall produce. The better way to ensure that you eat what you want is to grow it yourself. With the mild weather, if you planted a fall garden you may be harvesting some leafy greens, like spinach and collard greens, and vegetables, such as sweet potatoes and squash. These foods are high in iron, fiber, calcium and Vitamin A. Be sure to harvest your produce as soon as it is ready then move to preparation and preservation. Just in case you expect a hard freeze before your produce is ready for harvest, pick it anyway. You can always ripen indoors, or extend your growing season with hoop houses and row covers. Produce like squash and sweet potatoes can usually withstand more handling than ripened tomatoes. The best thing that you can do is prepare them for consumption or preservation as soon as possible. Proper preparation ensures that you retain nutrients, experience maximum flavor, and reduce waste. 5. M  ake handmade gifts. If you don’t have the time, skills or desire to grow your own food, you can certainly purchase from a local grower. A great place to find local seasonal products, including flavorful greenhouse grown tomatoes , is Tomato Tomäto, a yearround indoor farmers market, and if you like ordering online, check out Nebraska Food Coop, a local foods marketing and distribution service. http://food.unl.edu/web/preservation/canning. For neighborhood classes, check out Minne Lusa Canning Company; find the Minnelusa House on Facebook. If you have foodie friends or gift folks who like edible stuff, try making one of these to share: • a pint of homemade soup paired with a bowl or cup from a local artist • a batch of pumpkin or squash bread pudding in a reusable dish • a mason jar of homemade salad dressing with ingredients list (Newman’s Own started this way) • a bundle of savory or sweet cookies in a reusable tin or plate • a basket of local seasonal produce plus a cookbook with elegant, simple and tasty recipes Premium Gift Option: A three course meal prepared by you (or someone you recruit) featuring local seasonal ingredients. DIRECTIONS: Preheat the oven to 400 degrees. Dice the butternut and toss with one tablespoon of oil, the thyme, and a dash of salt and pepper. Place the squash onto a baking sheet lined with foil and bake for 40 minutes or until soft throughout. In a medium pan over medium high heat, melt one tablespoon of butter and one tablespoon of the oil together. Dice the yellow squash, garlic, and onion, then sauté them in the pan until tender. Sprinkle with a pinch of salt and pepper while cooking. Combine the roasted butternut, yellow squash, onion, garlic, milk, and apple cider vinegar into a food processor or blender and puree on high speed. Stream in the stock until a thick soup texture is reached. Season to taste with salt and pepper. In a 200° oven, place diced cinnamon bread to dry for ten minutes. Top the soup with a spoonful each of honey, parmesan cheese, and cinnamon bread bits. Enjoy. Empowerment Plan strategy and focuses on four key nodes of opportunity: 16th and Cuming: The vision is to create a front door and gateway to North Omaha by building on the tremendous progress in North Downtown. It recommends creating a sports and entertainment themed space complete with mixed-used buildings and housing. The plan anticipates that most of this development will be market-driven. 24th and Lake: Building on its rich history, the vision recommends the creation of an arts, culture, and entertainment district in the 24th Street and 24th and Lake area. The district will include civic and cultural attractions, restaurants, retail, mixed-used buildings, and mixed-income, mixed-type housing. 30th and Lake/Parker: The focus of this area is the creation of an urban village that builds on core assets like Salem Baptist Church, Charles Drew Health Center, Miami Heights, the Urban League, and the 20+ acres of open land now available with the demolition of the Pleasant View Housing Project. The vision for the area includes senior housing, mixedincome and mixed-type housing, neighborhood services, and an intergenerational community center. Malcolm X/Adams Park: The vision calls for the creation of a regional recreational attraction and international destination center by expanding and building on the work of the Malcolm X Foundation and City of Omaha Parks Department plans for Adams Park. The North Omaha Village Zone participants and supporters include neighborhood residents, neighborhood associations, elected officials, community organizations, educational institutions, businesses, churches and faithbased institutions, and other stakeholders. Alliance Building Communities, Nebraska Investment Finance Authority, and philanthropic partners provided the financial investment for the development of the action plan. The Alliance Building Communities group includes Omaha Economic Development Corporation, Holy Name Housing, Family Housing Advisory Services, and philanthropic partners. Key partners include the City of Omaha, a collaborative group of elected officials, Omaha Housing Authority, North Omaha Development Project, Schemmer Associates, and H3 Studio. The implementation plan will require financial investments from many different revenue streams including community, public, and private from local, state, and national sources. Most importantly, the success of the plan will be based on community support and engagement. Now is the time to Unite & Transform the community. Are you a leader? Do you want to make a difference? Learn how with over 800 other freshmen-seniors at the NEBRASKA Diversity Leadership Symposia. The North Omaha Village Zone: MOVING FORWARD WITH MAJOR DEVELOPMENTS Over the years there have been numerous plans to rebuild North Omaha. There are estimates of 20 to 30 different plans that were developed for North Omaha. Early in the process, the partners on the Village Plan made a commitment that the initiative would not end with beautiful pictures on the wall, but start with tangible, iconic projects that would be catalysts to the revitalization of North Omaha. The group also committed to making sure that current residents are involved in the design, implementation, and every phase of the redevelopment process. The vision is to attract people of all incomes to the Village Zone, while assuring that residents who currently live in the area benefit as much as anyone else. philanthropic organization to move forward on the first portion of the vision. The Empowerment Network identified the 30th and Parker area as the primary area of focus. At the time, the area was home to the Pleasant View Housing Project and a high level of gun violence. ABC partnered with the Empowerment Network, faith community, Highlander and Prospect Hill/Place neighborhood associations, and other partners to begin prayer walks, neighborhood cleanups, neighborhood outreach events and block parties, and summer job opportunities for young adults in the area. These partnerships led to the creation of the first “village area” and stakeholder meetings nearly 4 years ago. One of the most immediate needs identified in the area was to address the abundance of vacant lots. The group determined that a housing in-fill strategy would help bring more stability and much needed revitalization to the area. Using the initial funds that had been raised, ABC acquired over 80 lots in the area, raised additional funds, and built 21 new homes in the area. In addition, as the initial village strategies were moving forward, the Omaha Housing Authority announced that it would be tearing down the Pleasant View Housing Project. A short time later, the Nebraska Investment Finance Authority partnered with ABC to commission what would become the North Omaha Village Zone plan. The idea was to partner with the City of Omaha, North Omaha Development Project, and Omaha Housing Authority to create a comprehensive vision for the traditional heart of North Omaha. As a result, the North Omaha Village Zone Revitalization Plan was unanimously approved by the Planning Board and Omaha City Council. Instead of a “patchwork” approach, the Village Zone is a comprehensive vision for redevelopment and is now part of the city master plan. While there’s a lot of work ahead, the plan is beginning to generate interest from a variety of potential partners. Schemmer & Associates to create a comprehensive plan for transforming the Malcolm X area into an international destination. The plans will be revealed to the community in December. The community has consistently prioritized the Malcolm X development as one of the top opportunities for North Omaha. The City of Omaha, in partnership with the Empowerment Network and OEDC, recently received approval to build 80 additional homes in the Prospect Hill/Village area. Another key piece to the revitalization of North Omaha and the Village Zone area is to maximize the potential and redevelopment of Adams Park. A number of plans have been developed by different groups over the years. The City of Omaha Parks Department took all of the input from these various studies and plans and worked with H3 Studio and the community to develop an integrated plan. A highly functional, urban agricultural and green development is envisioned. A final plan will be released within the next few months. It will also include an overview of how Adams Park and Malcolm X developments connect. Change is in the air. In July 2011, the City Council unanimously approved the North Omaha Village Zone Revitalization Plan. Since the approval, recent announcements have highlighted significant new potential projects for North Omaha. The larger redevelopment projects will join significant work already in progress. The City of Omaha, Holy Name Housing, NeighborWorks, Jesu Housing, Habitat for Humanity, EXCEL, Greater St. Paul’s Bethesda Urban Development Corporation, and others are continuing their efforts to provide quality, green and affordable housing in the area. These developments with the addition of mixed-income housing and mixed-use projects are vital aspects of making the Village Zone vision a reality. While the redevelopment process always takes longer than originally planned (and there will unquestionably be delays and struggles), the energy, experience, and financial commitment from many sectors of the community will make sure that plans continue to move forward. It will take the support of the entire city, especially the residents and stakeholders of North Omaha to make the developments successful long-term! It’s time to DREAM AGAIN in NORTH OMAHA. It won’t be easy, but together we can CONNECT THE RICH HISTORY OF NORTH OMAHA to a THRIVING, SUSTAINABLE FUTURE. Imagine the possibilities. It is always exciting when a young African- American man is a role model for other young men. Anytime young boys can see young men achieve success it can be very inspiring to them. Garyth James Barnes made a conscious decision to work hard as a student, and with God’s guidance has proceeded to continue making wise decisions. Garyth comes from a strong Christian family who has instilled excellent values in him. They are a church-going family with a strong sense of community. It is quite apparent that his home environment has had a positive effect on him. When he attended Burke High School he lettered in swim, cross country, and track team, as well as giving back to the community by volunteering for the Goodwill. When Garyth lived in Jacksonville, Florida as a young boy, he spent time with a neighbor who was a Federal Express pilot. He could hardly wait to hear the neighbor’s stories about his experiences as a pilot. He was enthralled by the possibility of one day flying the friendly skies. So when Garyth had an opportunity to be a part of Burke High School’s inaugural Introduction to Powered Flight class, he was ecstatic. In this class he was taught the fundamentals of flying. By October of 2010, Garyth and his classmates were flying at altitudes of 9000 feet above ground. Garyth attends the University of Oklahoma as a freshman and is active in the ROTC. He is pursuing a military aviation career with the goal of one day becoming an officer in the United States Marines. He is also working on obtaining his private pilot’s license. His goals in life are well planned, and he is not afraid to work hard to achieve them. Ignorance Ain’t Got No Shame by Tracy Lenore Jackson is an inspiration, particularly for young women who are going through challenging times in their lives. Jackson tells of her life growing up in Kansas City, Kansas. Her writing is compelling. Some of the stories are hilarious; some are tragic. She shares incidents that many African American women can identify with. For example, her feelings about getting her hair straightened with a straightening comb brought back memories. Her book is sprinkled with everyday things that we can all identify with, even as she explores deeper issues. What is particularly fascinating is her candidness. There is a sense of how real her stories are. It is not about being impressive, but about being honest and true. The purpose of Jackson sharing her story is to inspire others and to bring to life some of the challenging issues that many women are struggling with. This book tells how she struggled with conflicting emotions that can be paralyzing and how she overcame these impediments that were detrimental to her success in life. Jackson said, “The journey of writing both my books helped me to learn how to love my husband completely by figuring out what has been bothering me all these years. It had nothing to do with my marriage or my husband. My hope is for other women to find the same freedom to love as I have.” Jackson’s inspiring book can be bought on Amazon or through her website at www.tracylenorejackson.com. She also has a sequel to this book that can also be purchased. You won’t be disappointed with this delightful read! MEINEKE car care center What types of services does Meineke provide? Meineke Car Care Center provides full service automotive maintenance and repair. We offer advanced diagnostic service, all factory scheduled maintenance, alignments, tires, brake service, exhaust repair, fluid and filters, etc. Basically anything that needs repair or maintenance on most cars or trucks. In addition, we offer nationwide warranties on all repairs, and free inspections on cars and trucks. How long have you been in business and tell us about your locations? We’ve been in business for 8 years. In 2003, our first location opened in Lincoln, Nebraska–on the corner of 48th and O. Our second location opened in 2009 in West Omaha, on 165th & Maple St. Both locations have knowledgeable and friendly staffs. You both have engineering backgrounds. What made you decide to start a franchise? I have always been interested in owning my own business. My grandfather always dreamed of owning a business, but never had the opportunity. I believe he passed this desire down through my mother, and it took hold of me at an early age. Also, my father has always had great business acumen, and constantly pointed out business opportunities when I was growing up. My wife Alisa grew up seeing her grandfather run a successful small business for decades, so she supported my vision for us to do the same. She is so strong and covers my blind spots so well, that I felt like we had all the bases covered to pursue the American dream. What recommendations do you have for others wanting to start their own franchise? a document required by law that gives full disclosure of the particular franchise. You should also talk to as many current franchisees that you can, not just the successful ones, but those who failed or had a hard time. Next, put together a realistic financial plan for the next five years. What would you consider to be your biggest success/ accomplishments in business? The goal of any business is to make money, but how you go about this has always been very important to me. I take great pride in how I treat my employees, and how they treat our customers. My dad always speaks of honesty, integrity and credibility as a litmus test for a job well done. Our greatest accomplishment has been creating a business where the employees are cherished like family and our customers trust us. It is an on-going process that we continually work towards, but for the most part we’ve been able to accomplish this in two different locations 60 miles apart. It’s no small feat. “Behold children are a Heritage from the Lord. The fruit of the womb is His reward.” Monday- Saturday: 6am-7pm Ages: 6 weeks - 14 years old Bibilical and Educational teachings 3020 Huntington Ave, Omaha NE. (402) 614-4257 • (402) 850-3729 Transportation provided. 719 N. 132nd Street, Omaha NE 68154 (402) 498-2718 jamesstinson@allstate.com Get any insurance quote today and Allstate will give $10 to the Tom Joyner Foundation that supports students at HBCU’s. Call or visit today. Jehovah Shammah Church International Pastor Edna Perkins, Pastor, Prophetess One Church, Two Locations • www.jsci.org 5401 N 90th (NW Campus) • 402-502-7752 • Sun Service 8:30 a.m. Beginning January 2012 Midweek Service Tues. 7 p.m. 3020 Huntington Ave (Main Campus) • (402) 390-6036 Sunday Service 11:30 a.m. • Midweek Service Wed. 7 p.m.